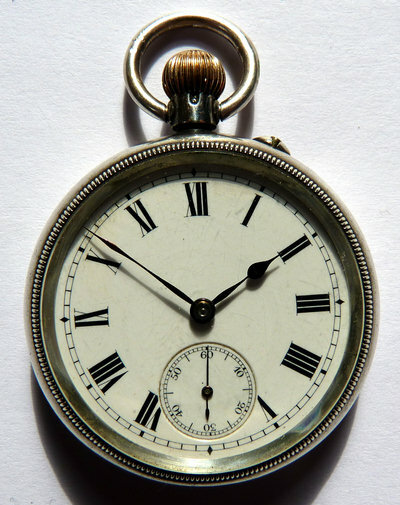 A watch, whether a pocket watch or a wristwatch, consists of broadly three parts, the case, the movement, and the dial and hands. The sub-pages to this page look at each of these parts in detail. The picture to the left shows a pocket watch, the one to the right a wristwatch. These watches have features that are similar to most watches of their era. The front view or "face" of the watch shows the dial, the flat plate with the numbers of the hours on it, the hands, which indicate the time, the bezel and the crown. 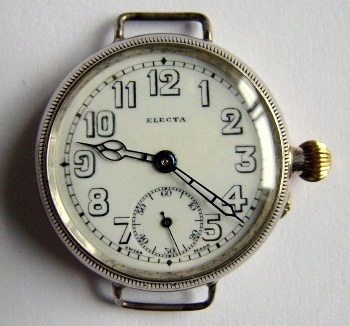 In old watches like these the dial is a flat plate of copper with an enamelled surface, in this case white enamel with black numerals. Enamel is made from ground glass which is spread onto the copper plate and then fired at a high temperature so that it melts and fuses together, forming a shiny smooth surface. The hands are metal, blued steel in these watches. The wristwatch has skeleton hands in the shape called "poire squelette" that were designed to carry radium based luminous paint, which has been removed. The bezel is the metal ring around the dial that carries the glass or crystal. The bezel might be hinged to the middle part of the case, or snap on to it. Bezels are usually plain, but the bezels of these watches are fluted or milled because they unscrew. The button or crown that sticks out from the top of the pocket watch and side of the wristwatch is used to wind the mainspring that powers the watch, and is also used to set the hands to show the correct time. There are two ways or engaging the hand setting mechanism. On modern watches you usually pull the crown away from the watch and it clicks out into the hand setting position. In these two watches the hand setting mechanism is engaged by a push pin, called pin-set or nail set. You use a finger nail to push in the pin that sticks out of the case next to the crown and then turning the crown sets the hands.